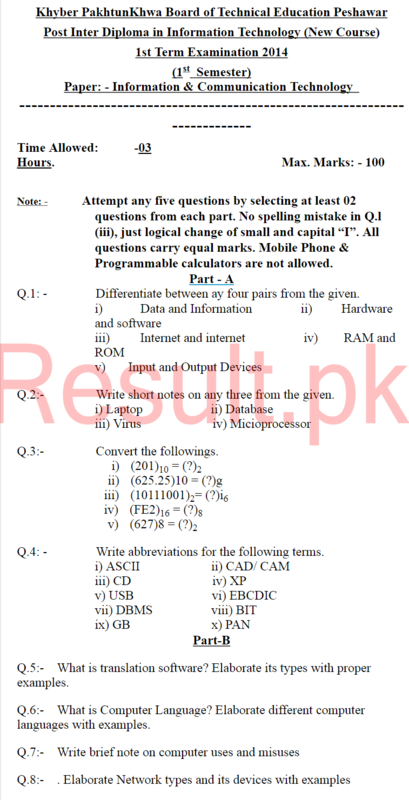 KPK Board of Technical Education Peshawar DAE, DBA, DIT, D.Com, DDM, DHO Past Papers 2018, 2017, 2016 to download online. Khyber Pakhtunkhwa Board of Technical Education Peshawar has the responsibility to conduct various technical and vocational exams in the province of KPK. All those institutes in KPK which teaches different intermediate level technical education to the students are affiliated with KPBTE. Exams of various types are taken by KPBTE including D.Com, DAE, DBA and others. Every year, thousands of students from various institutes participate in the technical, vocational and other exams under KPBTE Peshawar. KPBTE organizes various exams according to their particular schedule at different times of year. The whole examination procedure from the announcement of the date sheets to announcement of results take several months. Few diplomas are three year long while few are two year long courses. Students of different programs of KPBTE start preparation of their exams few months before the start of their exams. For this purpose, they use different study materials which also include KPBTE Peshawar DBA/ D.Com/ DBA past papers. All these past papers include important points about the papers including important questions repeated from time to time and also they inform about paper pattern of different disciplines. It is very important for the students to take help from these past papers as they provide special assistance which can help the students to take good marks in their exams. The students can purchase their required past papers from the market but the best way is to download the KPBTE DBA past papers, KPBTE D.Com past papers, KPBTE DAE past papers and other past papers from this website. Assalamo alikum Plz send me DAE electrical 2nd 3 year old paper.